Yes, I know it’s Summer but sometimes you just want soup… or at least I do! Soup is so easy to make and makes enough for lunch leftovers for a few days. I normally make some sort of bean soup but I had an abundance of lentils on hand so I thought why not a lentil soup. Plus, I was able to use some fresh kale and garlic scapes from the garden so that was a plus! 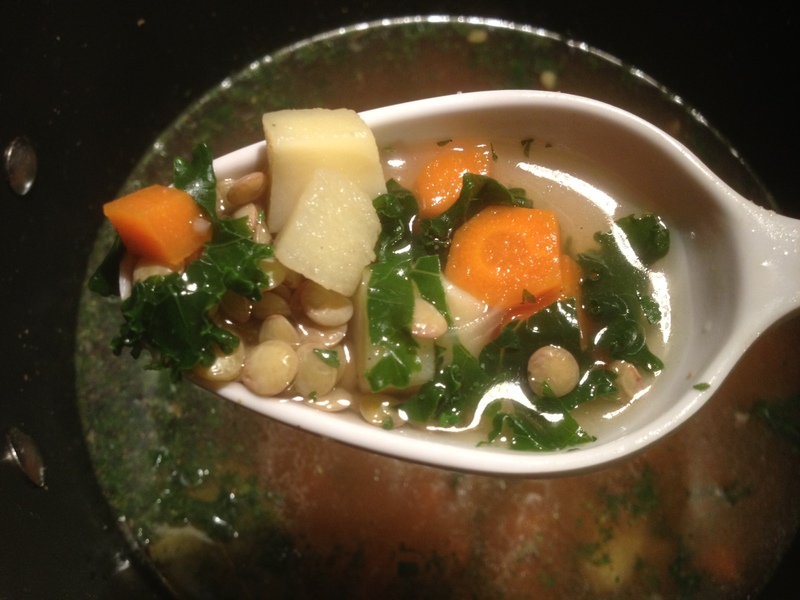 This soup is high in protein & fiber and makes a filling meal! Sauté garlic, onions, carrots, and turnip in 1/2 cup veggie broth until tender. Add 2 cups of lentils, 6-8 cups water, and 2 veggie bouillon cubes, 1 bay leaf, a dash of hickory smoke, and salt and pepper to taste. Cook on medium low heat for about 15 -30 minutes until lentils are tender. Add chopped kale last 10 minutes. If you’re using green lentils they’ll take longer to cook but hold up in the soup better without getting as mushy as brown lentils can when overcooked. If using brown lentils check after 15 minutes for doneness. Make it a stew! add chopped celery, diced tomatoes, chopped zucchini and reduce water by to 4 cups. It’s also great with spinach instead of kale. Just throw in whatever veggies you have on hand!